The Workplace file system is cloud based. Depending on your company settings, you may be able to modify your files using apps installed right on your devices. Files saved in Workplace are secure and backed up. Once you understand how your files are organized, you can access them from any approved device, even a smart phone or tablet. This article focuses on modern Work folders. For a better understanding of Classic (Work) folders, check out File and folder system. Modern Work folders will always appear at the root of your Workplace file system. These folders are displayed in the S:\ drive of your Hosted (Citrix) apps. 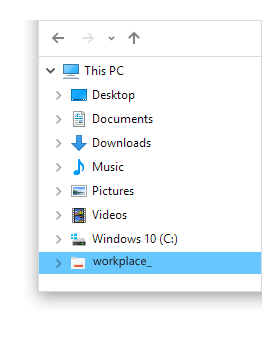 Click Files on the left side navigation to see all of the folders which you can access. In Hosted Apps (Citrix), this folder will appear as S:\<FirstName LastName>. This is intended to be used your personal files, like pay stubs, expense details, or a draft of a report you are working on. Only you and your managers have access to this folder. In Hosted Apps (Citrix), your custom shared folders will appear at S:\<FolderName>. Based on certain permissions, this may be for departments, projects, groups, etc. You can only see the folders that you shared or that have been shared with you. In Hosted Apps (Citrix), this folder is locate at S:\<CompanyName>. Any file located here is fully accessible to all users in the company. Confidential files don’t belong here, because everyone in your company has full access . There may be custom drives available in Hosted (Citrix) Apps. Company managers may have additional folders. You can not access either of these outside of Hosted (Citrix) apps at this time. Ready to share your workplace_ files with your coworkers?